More than one-quarter (27%) of Hispanics say they or a family member reported a crime in the previous five years. Native-born Hispanics are twice as likely as foreign-born Hispanics to say this—38% versus 19%. Hispanics ages 54 and younger are more likely to say they reported a crime than those ages 55 and older—29% versus 19%. Hispanics with at least some college education (40%) are also more likely to say they reported a crime than Hispanics with a high school diploma (30%) or those with less education (17%). Nearly one-quarter (23%) of Latinos say they or an immediate family member were questioned by the police in the previous five years. Native-born Latinos are more likely than immigrant Latinos to say this—32% versus 17%. And Latinos under the age of 30 are more likely than older Hispanics to say this—32% versus 19%. Among Latinos with at least some college education, 30% say they or a family member had been questioned by the police in the previous five years, a greater share than those who are only high school graduates (23%) or have less than a high school education (19%). U.S. citizen Hispanics are more likely than non-U.S. citizen Hispanics to say they were questioned by the police—28% versus 15%. More than two-in-ten (21%) Hispanics say they or an immediate family member served on a jury in the previous five years. Hispanics over age 55 (30%) are more likely to say they or an immediate family member had served on a jury than are those ages 40 to 54 (22%), ages 30 to 39 (14%) or ages 18 to 29 (19%). And Hispanics with some college education (33%) are more likely to say they or an immediate family member served on a jury than are Hispanics with a high school diploma (18%) or those with less than a high school diploma (14%). 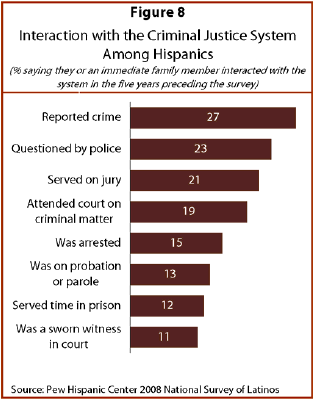 Nearly two-in-ten (19%) Latinos say they or an immediate family member had attended court on a criminal matter other than a minor traffic violation or jury duty in the previous five years. Latinos between ages 18 and 30 are more likely to say this than Latinos ages 55 and older—23% versus 13%. Among Latinos, 15% say they or someone in their immediate family was arrested in the previous five years. Nearly one-quarter (23%) of Latinos ages 18 to 29 say they or a family member were arrested, compared with 8% of adults ages 55 and older. And native-born Latinos are more likely than immigrant Latinos to say they or a family member was arrested—18% versus 13%. According to a recent report from the Pew Center on the States, 1-in-27 (4%) Hispanics in 2007 was under some form of corrections control, such as probation, parole, prison or jail. While 4% of Hispanics are under some kind of corrections control, more than four times (17%) as many say they or someone in their immediate family had been under corrections control in the previous five years. Native-born Latinos are more likely to report this than are immigrant Latinos—23% versus 13%. More than one-fourth (26%) of Latinos ages 18 to 29 say they or an immediate family member had been on probation or parole, or served time in prison or jail. Overall, 13% of Latinos say they or an immediate family member had been on probation or parole. Young Latinos ages 18 to 29 are more likely than Latinos ages 30 or older to say they had been on probation or parole—19% versus 10%. Also, native-born Latinos are twice as likely as foreign-born Latinos to say they had been on probation or parole—18% versus 9%. More than one-in-ten Latinos (12%) say they or someone in their immediate family served time in prison or jail in the previous five years. Native-born Latinos are more than twice as likely as immigrant Latinos to say that—18% versus 8%. And nearly two-in-ten (18%) Latinos ages 18 to 29 say they or someone in their family served time in jail or prison in the previous five years, double the share of Latinos ages 30 or older who say that (9%). Overall, more than one-in-ten (11%) Hispanics say they or an immediate family member served as a sworn witness in court in the previous five years. U.S. citizen Hispanics are more likely to say this than are non-U.S. citizen Hispanics—14% versus 6%. And native-born Hispanics are more likely than immigrant Hispanics to say they served as a sworn witness—16% versus 7%. More than one-third (35%) of Latinos report that there are areas within a mile of their home where they are afraid to walk alone at night.5 Though overall Latinos are more likely than the general population to report being victims of crime, their perceptions about neighborhood safety jibe with those of the general population, of whom 37% report that they don’t feel safe walking alone at night in their own neighborhood (Gallup, 2008). For Latinos, neighborhood safety perceptions do not differ significantly by gender, age, or education. Safety concerns are also consistent across nativity and citizenship status.